Our introduction to Vejer de la Frontera happened in the form of a flash of bright white against the clear blue sky brightened by the southern Spanish sun, as we headed off the motorway into the countryside and made our way up the winding road that snakes all the way around the hill leading to the village above. 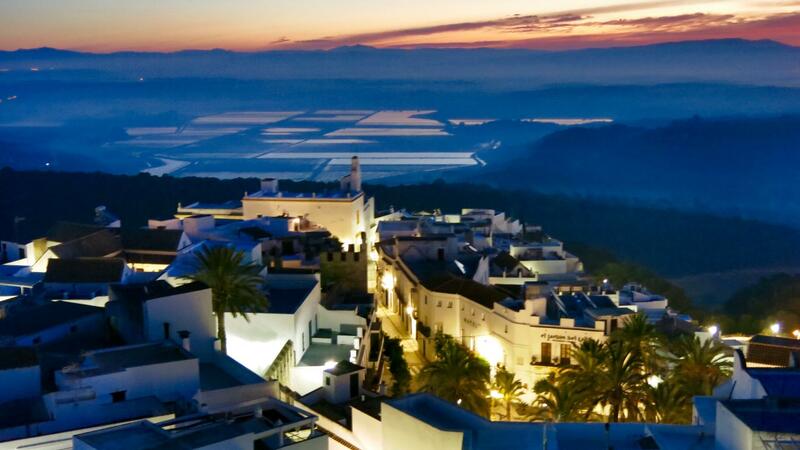 Vejer is a charming, white washed walled village perched proudly atop a hill in the countryside of Cadiz, Andalucia, in the south of Spain. It is a 40-50 minute drive from the nearest airport, Jerez, and a 15 minute drive from the unspoilt beaches of the Costa de la Luz. The history is fascinating. 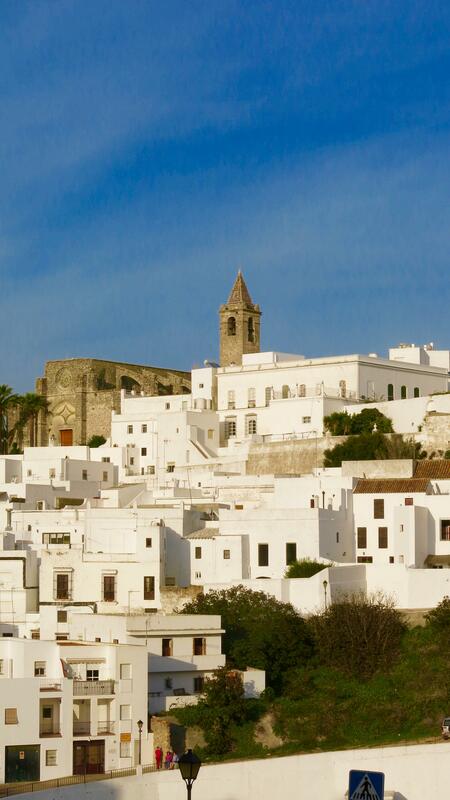 It was used as a fortress town firstly by the Phoenicians and then later on by the Romans. It underwent five centuries of Moorish rule until King Ferdinand of Castille captured it in from the Moors in 1248. 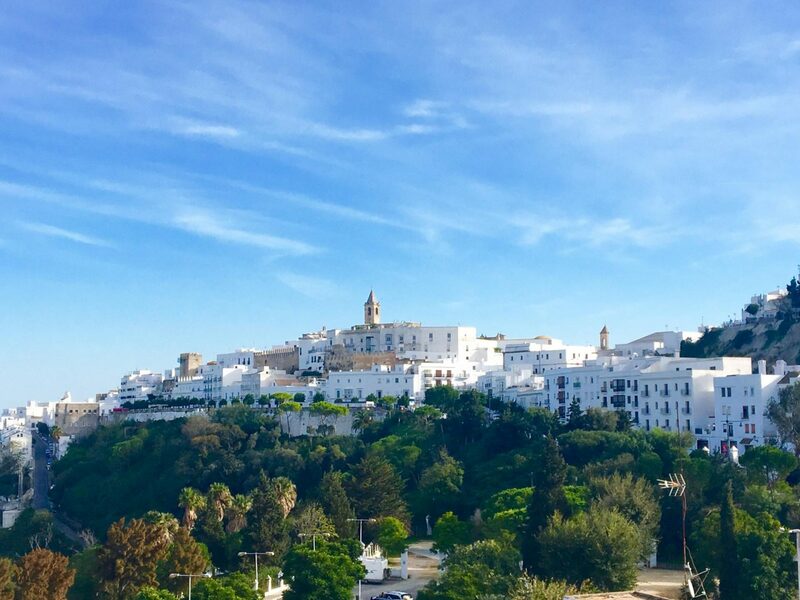 Vejer then became a border town against the Moors, resulting in ‘de la Fronter’ (of the border, in English) being added to the name. The old part of the village still retains a lot of the grand wall that once fortified it. 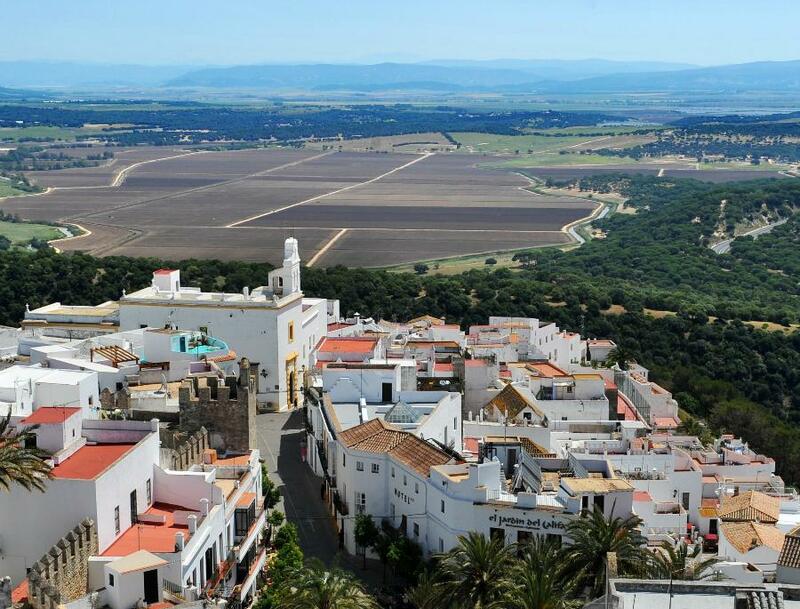 King Ferdinand eventually gave control of Vejer to Don Alonso Perez de Guzman, founder of the ducal house of Medina Sidonia. Interestingly, the famous battle of Trafalgar took place just off the coast near the town in 1805, so close that cannon fire could be heard from the village. It was declared a Historic Artistic Site in 1976 and has been alluring visitors ever since. Once in the old part of the village, the windy cobbled streets narrow to the point where it becomes impossible to navigate a car down them so we stopped in a pretty square, overlooked by the imposing gothic Iglesia del Divino Salvador (Church of the Divine Salvador). From there it was a short walk up the street to the charming and luxurious Hotel V. We were warmly welcomed by the lovely Manuela who settled us with a welcome drink and afterwards gave us a tour of the hotel, talked us through lots of informative things about the area, the sights not to be missed and pointed us in the right direction to find some delicious food typical to the local area for lunch. 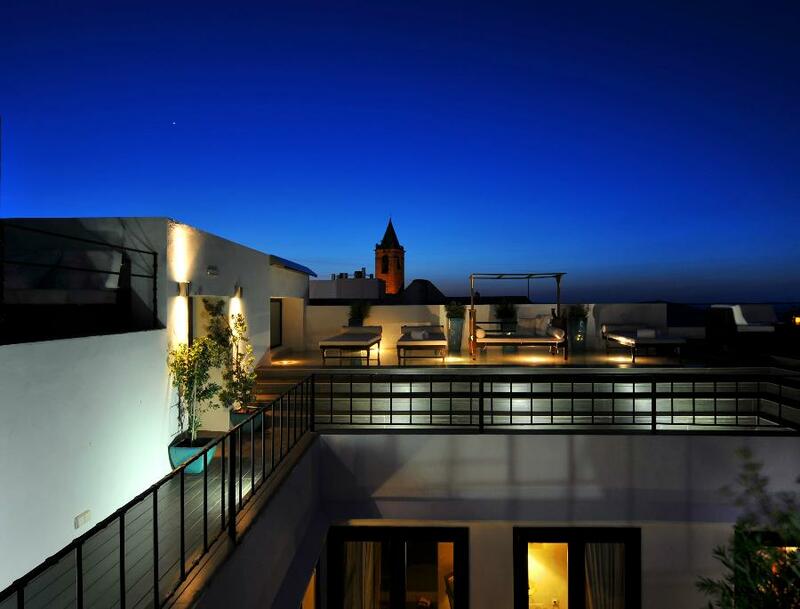 The luxurious boutique Hotel V is impressively located, perched at the very top of the charming white washed village. The hotel has 12 rooms, enabling a high level of personalised service. 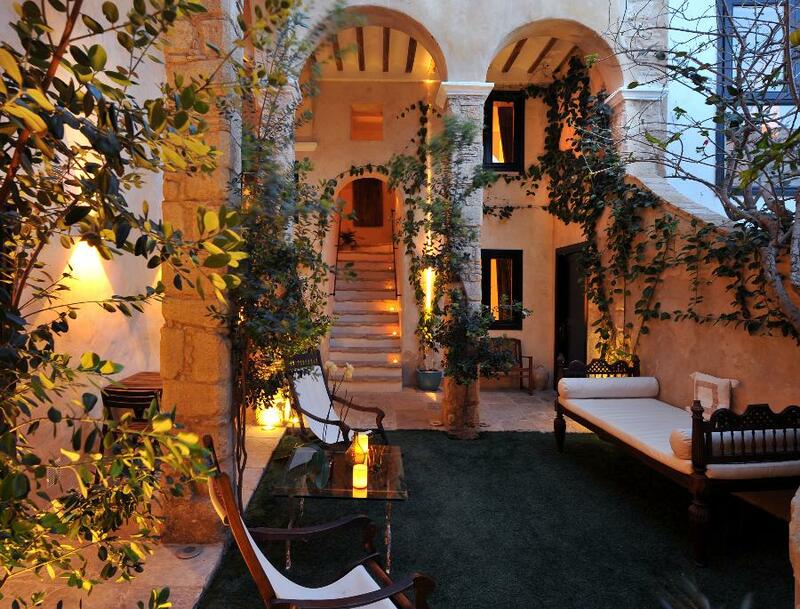 The 17th century property has been lovingly and luxuriously restored, blending original Moorish architecture with modern touches. The rustic white washed walls, exposed wood beams, tasteful decorations and plush furnishings all add to the enchanting feel of the hotel. 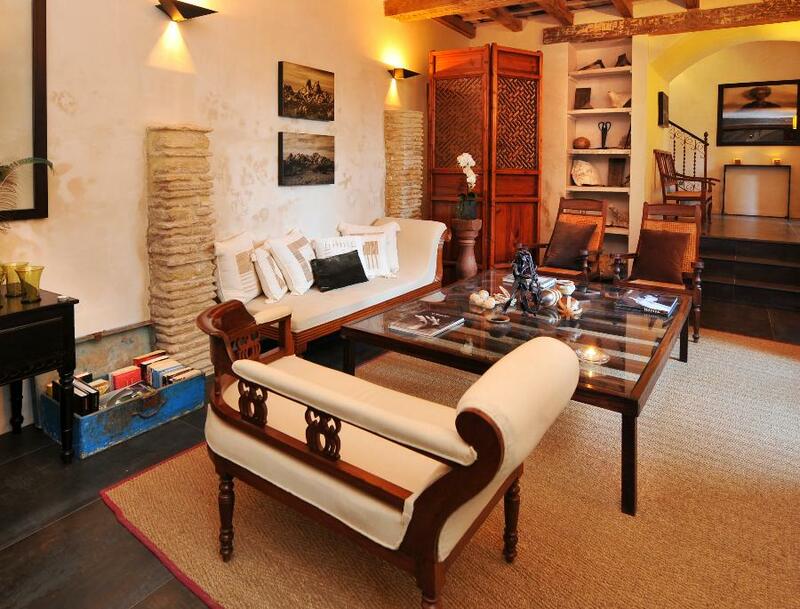 Every corner you turn there are inviting nooks and courtyards that have been lovingly decorated with antiques and local artefacts and furnished with comfortable, cosy chairs that make you just want to curl up with a glass of local Rioja and a good book and never leave. Speaking of Rioja, the hotel has a wonderful saloon area with an “honesty bar” that is stocked with a variety of local wines and sherry’s along with most of the popular spirits and mixers. You simply keep a note of what you drink beside your room number on the pad at the bar, all the more reason to never leave! 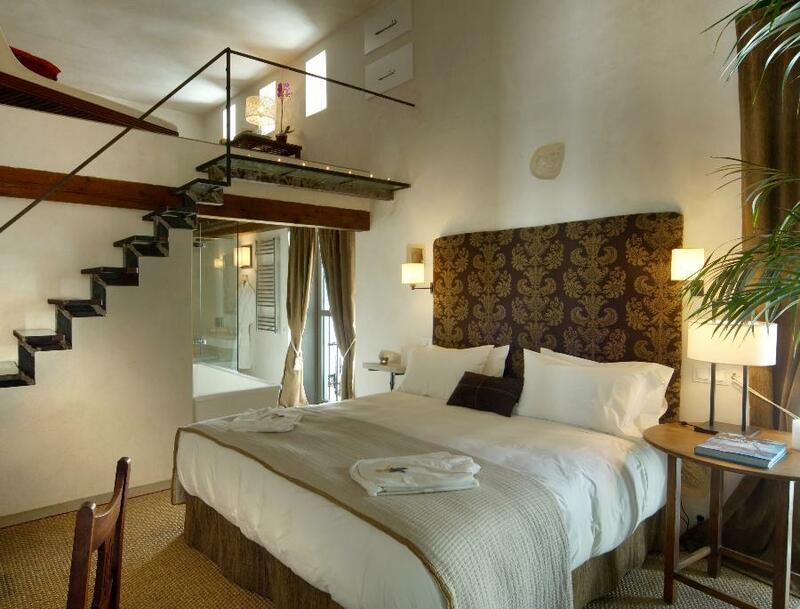 Our large superior room had views of the winding street below, high ceilings and my absolute favourite and unique part, a relaxation loft with a large day bed. 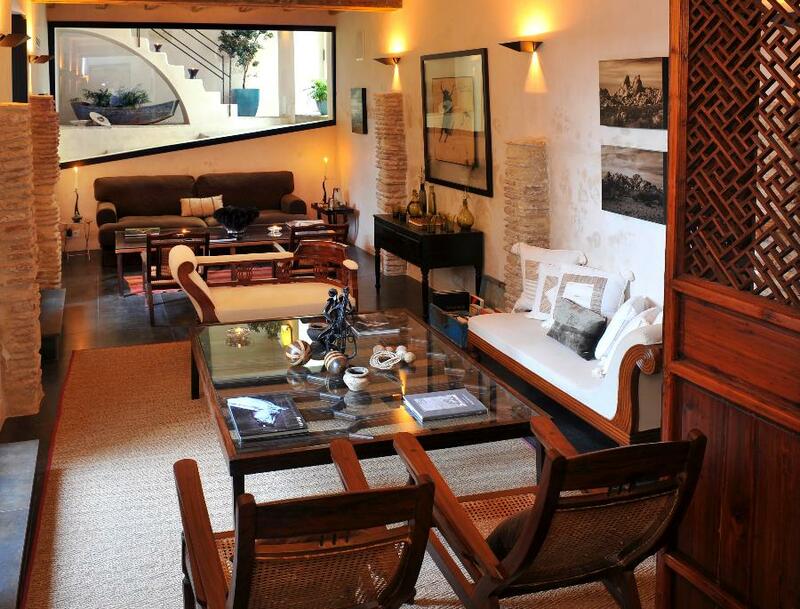 The room was furnished with dark wood furniture to contrast the white washed walls and neutral soft furnishings. The king sized bed was soft and luxurious with huge fluffy feather pillows that made us question if we actually wanted to get out and explore or just relax and enjoy the comfort all day. Curiosity reigned and we spend a satisfying afternoon wandering around, up and down the cobbled, ancient streets. We headed back to Hotel V just on dusk and immediately headed up to the stunning terrace to take in the 360 degree views at sunset. We were not disappointed. There are endless countryside views to the north, east and west. 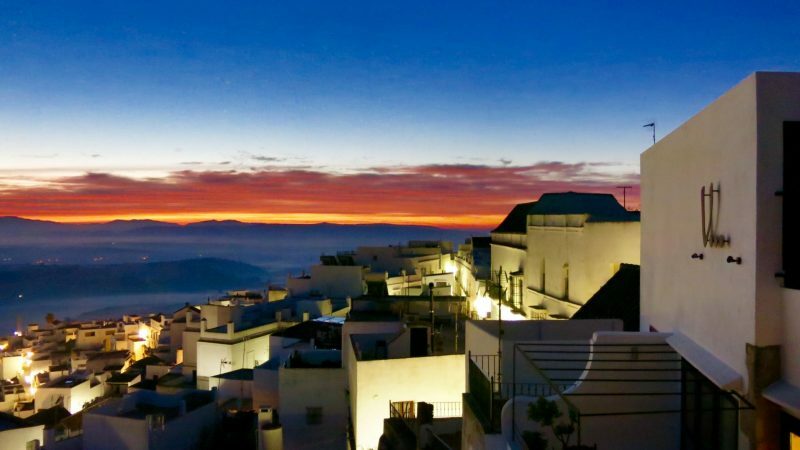 The south vista takes in the white washed buildings and church steeples of the old town and beyond to the Costa de la Luz where you catch glimpses of Morocco across the Atlantic ocean on a clear day. Looking just down from the terrace, you take in the bustling Plaza de Espana, with its bright colourful fountain in the centre featuring four large green traditional ceramic water spouting Andalucian frogs. The plaza is surrounded by date palms, ornate benches and delicious restaurants and bars. After dark we headed down to the hotel’s saloon bar area on the ground floor, enticing with smooth music, candles and soft glowing lighting. We sank into and the oversized, over stuffed sofa by the cosy well stocked “honesty bar” and digested the day over a couple of crisp gin and tonics. 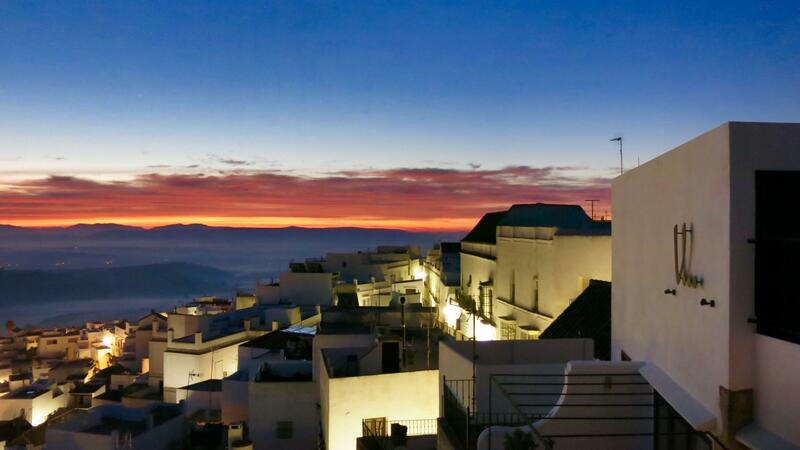 We had been tipped off that sun rises in Vejer could be more spectacular than sunsets. The weather for the day was forecast to be sunny, bright and 20 degrees, not bad for November. We woke early and were not disappointed. The terrace was the perfect vantage point and the sunrise over the mountains in the distance was one of the most beautiful pieces of nature’s artwork that we had witnessed. The sky brightened and the myriads of tiny birds noisily woke, signalling breakfast time. Breakfast is served in the hotel’s saloon between 8:00am – 11:00am. Arriving on a great big wooden tray, the continental breakfast is prepared with delicious local produce. Creamy local goat’s cheese in olive oil, pan con tomate, jamon, flaky freshly baked croissant, fresh fruit skewer and yoghurt are accompanied by freshly squeezed orange juice and Nespresso coffee. Satisfied, sustained and ready for another day of meandering and taking in the sights. However long you spend at Hotel V, it will never feel like long enough. 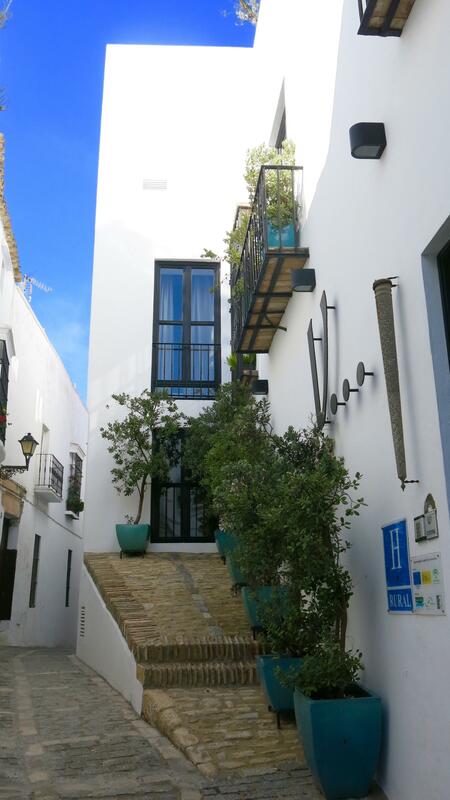 The hotels comfort and luxury along with Vejer’s narrow cobbled streets, history and character will leave you enchanted and wanting to stay for just one more day.